Winter weather is here and winter driving can be extremely hazardous at times due to poor road conditions or reduced visibilities from heavy or blowing snow. As a result, our District wants to communicate winter weather preparedness information to you, your children, and our staff. The safety of our students, staff, and patrons is a top priority. The decision of whether or not to hold school, have a late start, or an early dismissal is one that our District takes very seriously. There are many factors that go into that decision—amount of snow fall and sleet received; conditions of the roads, including snow pack, icing and drifting; winds and wind chill; visibility; and weather forecast. If we go with a two-hour late start, it gives the snow plows a chance to open up roads in the morning and it gives us further time to assess the road and weather conditions, plus it allows our bus drivers to drive in the daylight, rather than the dark. I know that a late start, early dismissal, and/or no school can create a hardship for parents and their work schedules. If we are able, we try to make a decision regarding school the night before but that is not always possible. In the event our District needs to call off school, start late, or release school early due to inclement weather, we will utilize our parent notification system, called School Messenger with Voice. If you have updates to your cell, home, and/or work phone numbers, please be sure to contact your child’s school office and speak to one of our admin assistants about making the necessary changes. Most of the time, we have had very good luck with our parent notification system, but there are times due to the magnitude of calls being sent out, that calls may be delayed. Please make sure that you rely on other methods too, as we also post weather-related announcements on the Sioux Falls television stations and some radio stations, as well as our school twitter account (@BeresfordSchool), Facebook (@BSDWatchdogs), and live feed on our district web page (www.beresford.k12.sd.us). Of course, as a parent, you always have the option to decide whether or not to send your children to school or pick them up due to the weather and/or road conditions. We thank you for your cooperation and appreciate the arrangements that you make for your children during weather-related emergencies and situations. Please plan ahead with your children. It is extremely important for you as parents to discuss with your children what to do for adequate winter weather apparel and emergency plans. Warm winter clothes, which includes coats, gloves, stocking hats, and footwear, is extremely important attire to wear to and from school, as well as on school bus trips in case a bus becomes stranded. If your child drives to school, please express to them the importance of taking their time and to drive slowly in the event of fog, ice, or snow. If weather causes them to be late, they will not be counted tardy. It is better to err on the side of caution and be safe. If we need to call off school during school hours, please rehearse with your children the plans they should have in place in the event you may not be home. Please let them know where you have a key to get into the house in case the house would be locked. Also, lining up an alternate location for your child to go to in case you are not home is also a necessary plan to make at this time. At the conclusion of this letter, our District has included information on: 1) Winter Travel Safety Tips; 2) Winter Survival Kit; and 3) Stranded in a Vehicle during a Winter Storm. Please review this important information with your child. This information was obtained from various agencies concerned with the safety of South Dakota citizens, including: the SD Department of Public Safety, SD Department of Transportation, the Federal Emergency Management Agency, and the National Weather Service. · Don’t warm up vehicles in enclosed areas, such as a garage. · Listen to the forecast before departing and postpone travel if inclement weather is occurring or expected. · Avoid traveling alone and give extra time to reach destination. Inform others of your timetable and planned routes. · Always buckle your seatbelt. · Dress for the weather and keep winter wear and extra blankets in the vehicle. · Keep your gas tank near full to avoid freeze up and have the ability to run the vehicle’s heat. · Slow down and adjust your speed to the road conditions and increase following distances. · Don’t use cruise control on icy or snow packed roads. · Keep a cell phone and charger in your vehicle to maintain a line of communication. · Keep safety tools in your vehicle, such as jumper cables and tow rope. · Carry a Winter Survival Kit in your vehicle at all times. · Flashlight with extra batteries. · First aid kit and medications. · Non-perishable food, such as granola bars and peanuts. · Extra clothing, sleeping bags, or blankets. · Jumper cables and tire chains. · Cell phone with fully charged batteries and charger. · Windshield scraper and brush. · Brightly colored cloth to tie on the antenna so the vehicle can be easily located. · Stay with your vehicle and wait for help. 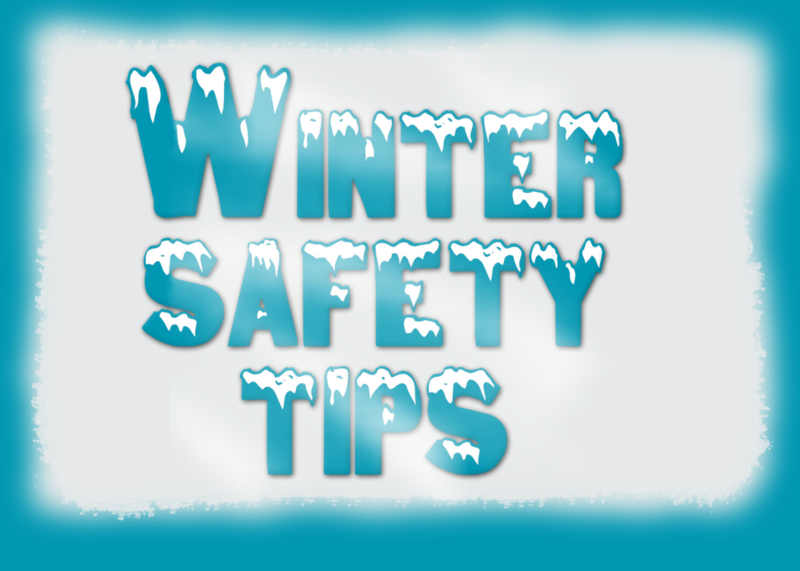 Many winter deaths and injuries can be attributed to people venturing away from their vehicle. · Use your cell phone to call 911. Be aware of your location and situation. · Move all of your emergency supplies from the vehicle’s trunk to the interior of the car as soon as your realize you may be staying for a while. · Check your supplies to see what you have available and arrange them in order for their use. This will help you ration them in case you are stranded for a long period of time. · Run the engine sparingly. Start with 15 minutes every hour and adjust if needed. While running the engine, keep a downwind window cracked to prevent carbon monoxide buildup. · Keep the exhaust pipe clear of snow. · If the cold is extreme, it may be necessary to keep the engine running continuously. It may not restart if shut off. · Never go to sleep with the engine running. · Turn on the dome light at night while the engine is running. It may help others to locate you. Turn it off when you turn off the engine so you don’t run down the vehicle’s battery. · Put on warm clothing right away, before you start to get cold. It is easier to stay warm than it is to regain lost warmth. Loosen tight clothing so body heat can circulate. Remove metal jewelry, as it can chill you. · Keep your feet off the floor if the heater is not on. · Use newspapers, maps, or even removable vehicle mats for added insulation. · Do mild exercises to help you stay warm. · Watch for signs of frostbite or hypothermia. · Eat a snack of high calorie food just before sleeping to stimulate your metabolism (heat production). If you awaken due to the cold, eat some more high energy food and add another layer of insulation such as more clothing or a blanket. · Tie a colorful banner on the vehicle antenna. If you need to leave the vehicle for any distance during the storm, tie a nylon rope to the vehicle and yourself so you will be able to find your way back to the vehicle.